When making these Braised Duck Breasts with Apples and Onions, your kitchen will smell like a high-end restaurant. 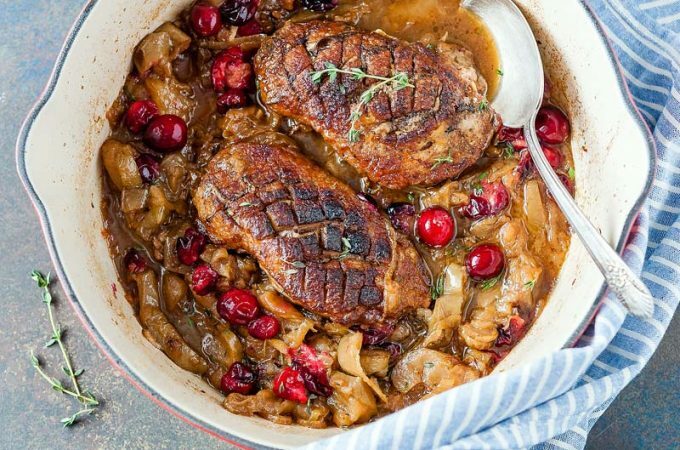 Succulent duck breasts meld together with delicious sweet and tart apple-onion sauce with cranberries. It’s a comforting and delicious meal perfect for any celebration or just a cozy weekend dinner. This recipe for the Braised Duck Breasts with Apples and Onions is an homage to that Russian Duck with Apples. In Russia, the most popular duck recipe is for the whole duck that is stuffed with whole or chopped apples and then roasted in the oven. In my version, I use duck breasts that I sear first, then braise in a delicious mixture of Ontario apples, onions, thyme, and cranberries. For those who think that braising duck breasts is a sacrilege, I tried this same recipe with duck legs also. It works and is totally delicious but I personally like Braised Duck Breasts with Apples and Onions more than the legs. To make this recipe even more Russian, I serve it with buckwheat, which is a traditional side in Russian cuisine.